A stirring tale of survival against the odds inspired by Shakespeare’s fantastical story of shipwreck, love, loss and redemption. "A great reworking of a wonderful story. By pulling apart the narrative we all feel pulled apart with it, but then by the end we are back together again! Phew." Having been abandoned by her father a few hours after her birth, Marina, now a young woman, tries to piece together what happened. Her father, Pericles, was forced to flee his country having provoked the anger of a ruler more powerful than himself. He won her mother’s heart in a joust. Her mother died on board ship giving birth to her. And her father, Pericles, is a broken man. An extraordinary series of coincidences sends them scurrying round the Mediterranean and brings them back together. A pair of story-tellers play a multitude of characters, evoking – in this ancient tale – a world in which a young girl is sold to a brothel; in which conflict and famine are devastating parts of Syria, Lebanon and Turkey; in which a fisherwoman finds bodies tangled in her nets; and in which the kindness of strangers saves those in peril on the Mediterranean Sea. "Wonderful, full of wit and charm but also with the pathos and power so important in conveying the moral undercurrent that runs through the story. We were completely enthralled - thank you so much for a really brilliant evening." How to see the world in a grain of sand? 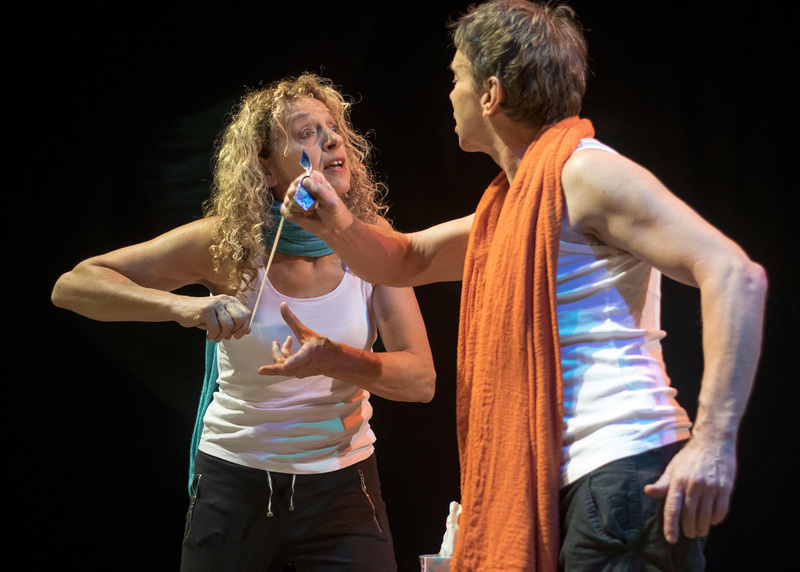 With just two people and one tiny room, Multi Story Theatre brought us on a journey through the treacherous Mediterranean ocean, the beaches of Greece, Libya and Syria, through time and space in a show that felt both ancient and modern. This hour-long adaptation of Shakespeare’s ‘block-buster’, Pericles, traced the convoluted story of a family split apart by terrible circumstances. With moments of great beauty and elegance and real comedy throughout, this fast-paced show brought this ancient tale right up to date, with the idea of ‘bodies being fished out of the sea’ fleeing danger, or the real plight of young trafficked women brought to life with great pathos and skill. I was told that this would be a master-class in theatre, and I was not disappointed, with fluid, dynamic and assured performances by two master actors. 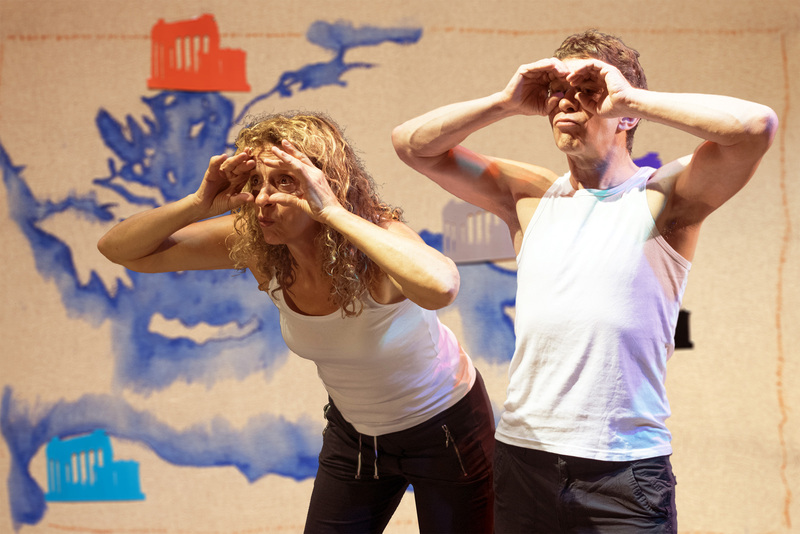 On Tuesday, 20th June, at the Balby (Doncaster) Quaker Meeting House, we were treated to a performance of 'Pericles - All At Sea' by the 'multi story theatre company' and what a treat it was. The play is based on 'Pericles - Prince of Tyre’, a Jacobean play partly written by Shakespeare and partly by an associate, George Wilkins (probably). The language was largely ‘Shakespearian’ in style but was delivered it in such a way that it was natural and easy to follow. The story is reworked and performed by a pair of actors ( Bill Buffery and Gill Nathanson) with great skill and presence. They told the tale of Pericles travels, shipwrecks and other dangers, and his various relationships by playing all the characters. 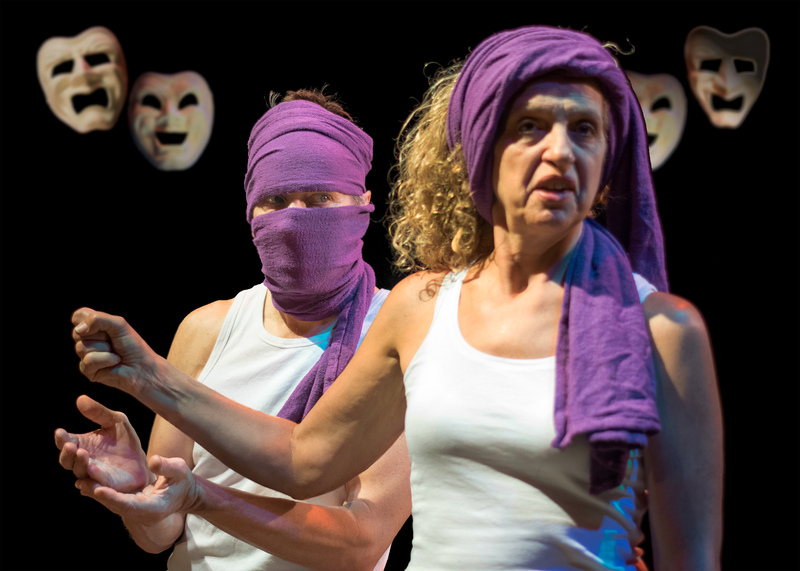 It is recognisably the original play but lightened by humour and clever little additions. The set was minimal, and largely of neutral colours which highlighted the brightly coloured cloths worn by the actors. Personally, I like a set which does not ‘spoon feed’ the audience but challenges them to use their imagination. After all Shakespeare didn't bother much with elaborate sets! This set was just right for the play. We were kept in the picture with a map on which they placed the locations as Pericles reached them. The characters were very ingeniously identified by the wearing in various ways of a range of coloured cloths. We very soon were able to follow who was who by what they wore. In addition the actors, through their facial expressions and body language, flicked from one character to another apparently effortlessly, but clearly after a great deal of planning and rehearsal. Music played a part in the actions and eventually I realised that it was controlled by the actors with discrete foot pedals on the stage operated so that you hardly noticed. I was completely engaged from the moment they stepped up on stage. The whole story was condensed into an hour which passed very quickly. It is a wonderful tale of adventure and endeavour told by two fine actor/storytellers and delighted in by all. 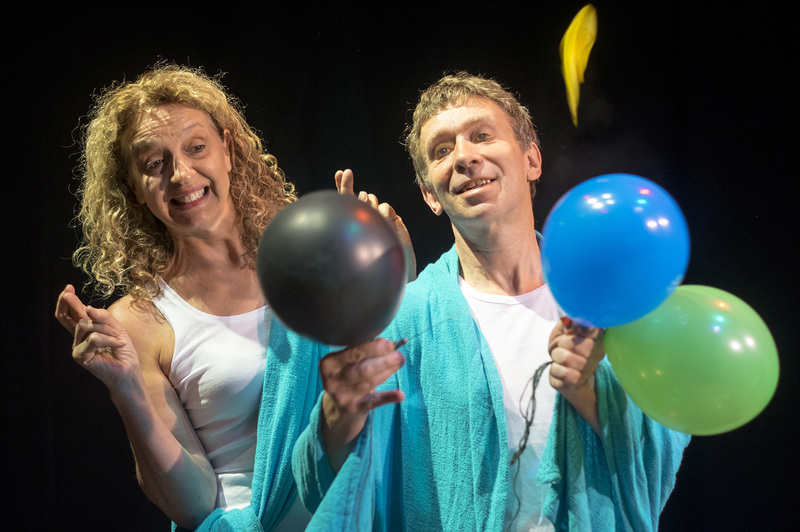 With Pericles – All at Sea Bill Buffery and Gill Nathanson have created a truly unique retelling and reimagining of the Shakespearean “Pericles, Price of Tyre”. Stirring and absorbing as a journey on top of a wave, this very physical performance has every movement and sound accounted for. The quirky Fringesque adaptation of the classic story merges with the modern day take on the eternal issues of love, humanity and redemption in an elegant and humorous way. A beautiful touch with reality, and an ingenious play with the costumes – every character had his own way of wearing a different colour scarf! The two actors’ presence is peerlessly captivating, their talent and chemistry is the third – and very well spoken – artist on stage. Truly excellent play and a credit to the First Limerick Fringe Festival! Having been abandoned by her father a few hours after her birth, Marina, now a young woman, tries to piece together what happened. Her father, Pericles, was forced to flee his country having provoked the anger of a ruler more powerful than himself. He won her mother’s heart in a joust. Her mother died on board ship giving birth to Marina. And her father, Pericles, is a broken man. But an extraordinary series of coincidences sends them scurrying round the Mediterranean and brings them back together. A pair of story-tellers play a multitude of characters, evoking – in this ancient tale – a world in which a young girl is sold to a brothel; in which conflict and famine devastate parts of Syria, Lebanon and Turkey; in which a fisherwoman finds bodies tangled in her nets; and in which the kindness of strangers saves those in peril on the Mediterranean Sea.